The Chinese Language Group was developed in response to the changing demographics within our catchment area. According to the U.S. Census Bureau, the number of Asian individuals 18 years and older residing in Community District 8 increased 54.6% between 1990-2000. Some of our Asian clients indicated that they were no longer able to travel to Chinatown in lower Manhattan to socialize with other people who speak their language. The group meets every second Thursday of the month: 2:00-3:00pm. Green tea and Chinese sweets are provided. Please call Jian Ping Zhang at 212-879-7400 ext. 106 for further information. 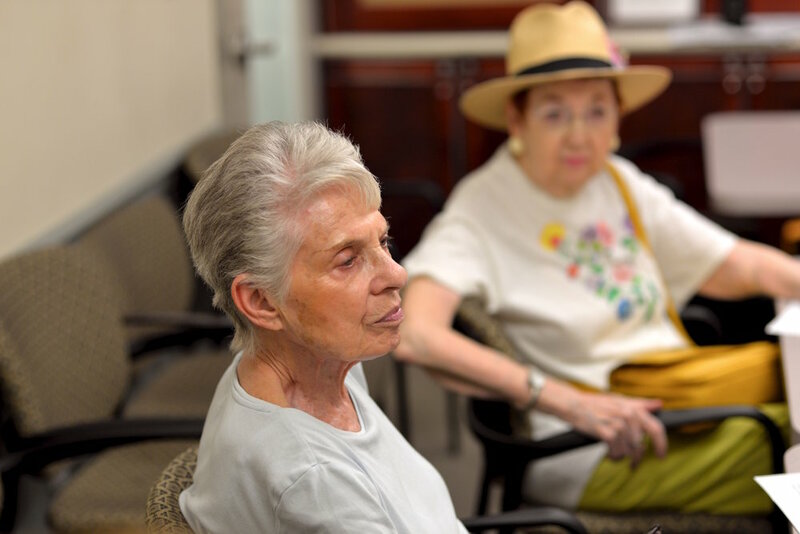 The Women's Support Group was created to give women over the age of 60 a safe and creative space to come together to discuss a variety of topics. The topics include: women's issues, current events, fashion, love/dating, hobbies, poetry, etc. Welcoming and supportive, this group provides an opportunity to learn from one another's experiences and opinions. We encourage socialization and it's an easy way to meet women with similar interests! The group meets on Wednesdays from 2:00-3:00pm. The Happiness at Any Age Group is open to men and women age 60 and older residing within our catchment area (57th Street to 96th Street) who can come to visit the Carter Burden Network's headquarters office. The group meets monthly from 2:00-3:00pm and is coordinated by a Social Service social worker. This is an upbeat group where participants share stories about positive life experiences and talk about stress relieving tips and ways that they can improve their mood. Participants also discuss the aging process and what they are doing to actively live a more joyful and meaningful life. Refreshments and cookies are served.